A sparkling second-half performance ensured that Russia are virtually guaranteed to qualify for the knock-out rounds for the first time in their modern history, in the wake of a 3-1 victory over a poor Egypt. Flying winger Denis Cheryshev, who began the tournament on the bench, took a share of the Golden Boot race with his third World Cup goal, while Russia have eight goals after just two games, having failed to win any of their seven warm-up matches before the home tournament. A team that have often buckled under expectations, this time have exceeded them, to the incredulity of a nation that merely hoped to avoid embarrassment. Swapping out dynamic but underperforming striker Fedor Smolov from the starting line-up for towering Artem Dzyuba, from the start the home side looked to exploit Egypt’s vulnerability to crosses, evident in their opening-game defeat against Uruguay. The midfielders diligently looked for the target man from all over the pitch, but deliveries lacked quality, and Dzyuba, who also came on to score in Russia’s rout of Saudi Arabia, was tightly marked. For Egypt, star man Mohamed Salah, playing his first game after a month out with injury, appeared tentative and unwilling to embark on his devastating runs towards goal, though the Liverpool attacker still looked like The Pharaohs’ most dangerous outlet, with a shot that whistled past the post. Both teams appeared determined not to sit back waiting for errors, but missed a cutting edge. 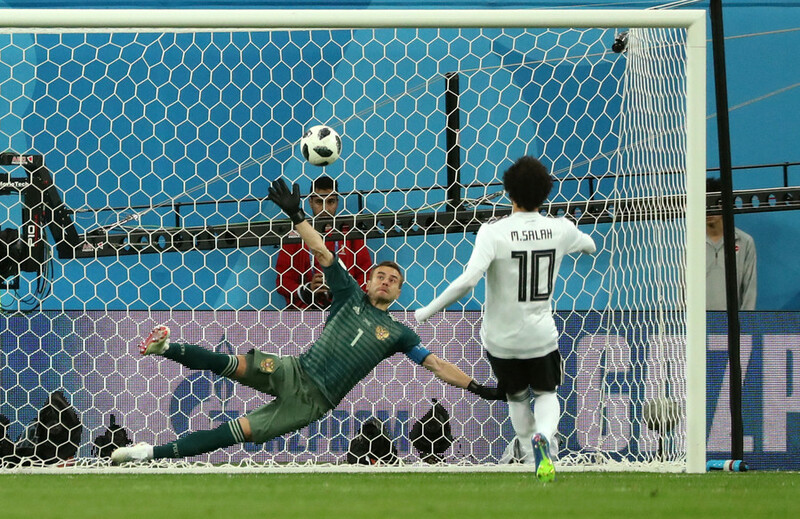 Yet it was a mistake that broke the deadlock at the start of the second half in what had been an evenly-matched tie, when Egypt central defender Ahmed Fathi tragicomically deflected a bouncing knee-high ball past his outstretched goalkeeper. Pushed forward by a thumping 64,000-strong crowd at the St. Petersburg Stadium, the reds grew in stature, Cheryshev popped up with a vital effort, converting a Mario Fernandes ball beyond Mohamed El-Shenawy. The match threatened to escalate into another thrashing when Dzyuba was rewarded for his toil with a well-taken goal on 61 minutes. Salah got his name on the scoresheet after being fouled on the edge of the area, before VAR adjudged that the infringement had actually occured inside the box and the striker stepped up to power his penalty in the top corner. But the result was never in doubt, as Russia held on for the final 20 minutes, enjoying several more chances to stretch their lead. While both teams technically remain in the tournament, the only way Russia could fail to get to the knock-outs would be if Saudi Arabia were to score two big wins in their remaining games, and if Uruguay were to inflict a massive defeat upon the team in their remaining game. More likely, the European and South American sides will play for the top spot in Group A during the final group game in Samara on Monday. Egypt will look to salvage pride when they seek their first-ever World Cup win against Saudi Arabia. But Tuesday was all about Russia – a much doubted team apparently short on talent that have produced an historic performance, and in the process set off a thousand street parties from Kaliningrad to Vladivostok.